I have an oil leak positively identified with the use of leak tracer dye and UV light dead center on top of the oil pump. I have installed a new 36 mm type one oil pump modified for the type 4. I also applied a generous amount of my favorite gasket sealer yet the leak remains. It will only leak with the engine running which indicates to me it is under pressure. My theory is that the case halves may not have had enough sealer on them during engine asssembly. My question then is how do I seal this thing without splitting the case? 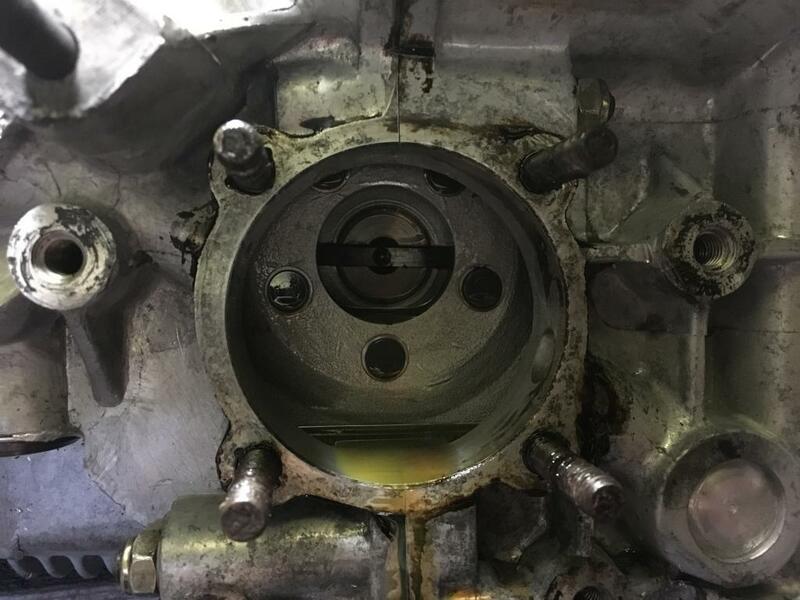 Can I apply sealant to the circumference of the oil pump? Any thoughts or experiences appreciated. A 36mm oil pump, sheesh that's pretty big. Too much pressure? Maybe? Purchased from the type 4 store. Only option. That must be leaking around the pump pretty good! Why it's the wrong pump to use. I use the shadek pumps, 26mm on my big T4, 30mm needs a pressure relief cover. Shadeks quality is good except for the case hole size, I now run a thin bead of yamabond inside the case hole past the galley holes. Real thin bead because most of it will be squeezed into the case, a small amount of yamabond will stay put. You could try cleaning it up good, including inside the hole as best you can, and a thin bead of yamabond inside and out of the case in this area. Only put the yamabond where you're 100% positive it's 100% clean and degreased. If that doesn't work nothing short of splitting the case will work. If you split the case I'd inspect that area. Thanks, Mark, I’ll try that. I suppose I can find this yamabond and the local auto parts store? Unless I overlooked it the 30 mm oil pump was my only option at the type4 store online. I did multiple searches and read many threads suggesting the 26 mm pump. I was ina bit of a hurry so I went with the 30. Besides the wrong pump,sealing face on the case looks pretty dirty...just saying. Yeah, I didn’t clean all the old sealer off before I took the picture. It’ll be clean before reassembly. I’ll try and remove the studs and flatten it as best I can. Fortunately this is in a 912e so it’s pretty easy to get to! You're going to have to dump that oil. clean, clean, clean! Yamabond you have to go to a Yamaha bike dealer, amazon or evilbay for Threebond 1104 neo. When using “yamabond” sealant, do you still put the gasket in place? Seems like ya wouldn’t, just want to be sure.